1. 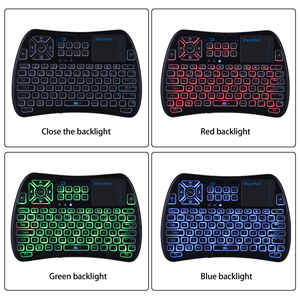 On keyboard remote, hold down the power button until the LED lights solid. 2. 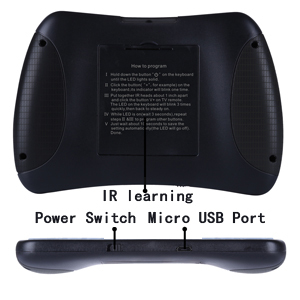 Put together your keyboard remote and the source IR remote, head to head, approximately 1 inch apart. 3. Press the button on keyboard “+” for example, and the LED will start blinking and be steady on, then press the button V+ on your source IR remote. 5. While LED is on solid, repeat steps 3 and 4 to program other target buttons. 6. When the learning process is all completed, just wait for its auto setting process approximately 10 seconds till the LED goes off. 7. It is ready to use, now. Note: Please wait for 3 seconds before programming the next button. 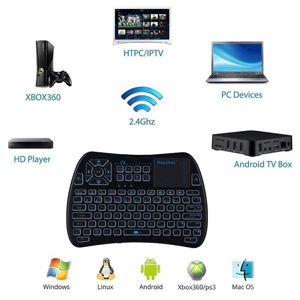 iPazzPort Wireless Keyboard + Mouse + Touchpad+3-Color backlit, RF 2.4G wireless connection, enjoy up to 10m operating distance. 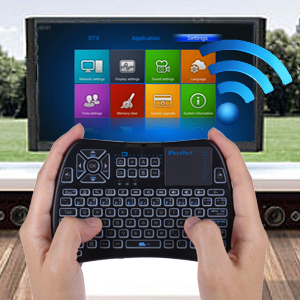 iPazzPort mini keyboard with touchpad and QWERTY, work for Android TV Box, Raspberry Pi, Smart TV, PC and other devices which support USB port. 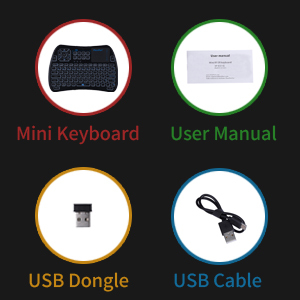 Turn on/off keyboard with the switch button to save power. USB Port to plug the included USB cable to charge the battery.